Born in 1962, in Davos, Switzerland, Conrad Jon Godly addresses the symbiotic relationship between human nature and the sublime; finding a beauty in the awe and terror of nature. Godly’s paintings are a reminder of the futility of human existence, whose blunt expression of natural forms are an exercise in capturing the intricacies of the dramatic. Godly’s Dark is Light, 2018 series, for example, exposes the purity of nature; his heavily impastoed canvases are not only a recurring motif, but work as a demonstration of the semiotic richness of one’s surrounding environment. 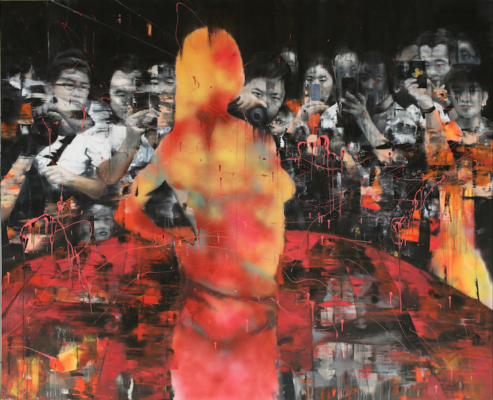 After graduating from Basel’s School of Art in 1986, Godly moved away from his nexus of inspiration in Switzerland, changing both his surroundings and medium. From 1988-2004, Godly’s photographic work found international success both in magazines and advertising, and, on Godly’s brief return to Europe where he settled in Vienna, Austria, Godly migrated to Japan, where he currently lives and works. It seems fitting that Godly’s 2017 work combines a series entitled, Dark is Light and, Godly, perhaps reaffirming the idea that the spiritual in Godly’s work is ever present. We as the viewer, are directly confronting the spiritual in a moment of quiet contemplation, exposed to the elements in this sequence of mystical experiences. If one has never experienced the silence and dramatic tension of the mountains, Godly’s work traverses its viewer to the summit of vertiginous proportions, giving over his canvases to the all consuming elements of nature.